The hunt for life on other planets is due for a makeover. Although it is often confined to planets orbiting in the so-called habitable zone where proximity to their host stars makes temperatures just right for liquid water, many astronomers are beginning to think outside the “Goldilocks” box. Some wonder if previously overlooked mechanisms—including life itself—could broaden the habitable zone well beyond its current definition. Colin Goldblatt, a planetary scientist at the University of Victoria in British Columbia, even argues that life’s ability to alter a planet’s climate poses a new paradox: A planet’s habitability could depend on whether life has already made itself at home there, a situation that would place habitability and life in a baffling chicken-or-egg scenario. Goldblatt has been looking beyond Earth-like atmospheres to see how different concentrations of nitrogen and carbon dioxide might tweak a planet’s habitability. Higher concentrations of carbon dioxide, for example, could keep a planet that is relatively far from its host star toasty whereas lower concentrations could keep a close-in planet chilly. Nitrogen is more complicated because higher concentrations both scatter sunlight (helping cool a planet) and make greenhouse gases absorb light more efficiently (keeping it warmer). At the fall 2015 American Geophysical Union meeting in San Francisco, Goldblatt argued these gases could help keep a planet habitable. He recently summarized his talk in a paper* published to the preprint server arXiv. “It’s a property of the planet that you’re living on.” Earth, for example, has a built-in temperature control system: the carbon–silicate cycle. Some 2.5 billion years ago the sun was so faint that the oceans should have been frozen—but they were not. The simple explanation is that Earth likely boasted an atmosphere thick with greenhouse gases. Then as the sun’s brightness grew, the planet counteracted the warming climate by scrubbing carbon dioxide from the air: Higher temperatures increased rainfall, which pulled the greenhouse gas from the atmosphere and carried it into the oceans, where plate tectonics eventually subducted it into Earth’s mantle. Today most of the world’s carbon dioxide is safely stored beneath Earth’s crust. Had the opposite occurred and the sun’s brightness waned, the planet might have counteracted the cooling climate by pumping more carbon dioxide into the air. Cooler temperatures would have slowed precipitation and increased volcanic eruptions, spewing the greenhouse gas out of the Earth’s mantle and back into the atmosphere. This balancing act has stabilized Earth’s climate for billions of years, letting the carbon dioxide swing up or down by more than 1,000 percent in order to keep the planet’s temperature steady and thereby increase the size of its habitable zone. And it is not just due to geochemistry; the carbon–silicate cycle depends on biology as well. Carbon dioxide is removed from the ocean when sea creatures convert it into the calcium carbonate they use to build their shells. After those creatures die they sink into the deep ocean where their shells are subducted into the mantle. For an example of this phenomenon, Goldblatt points to the White Cliffs of Dover. 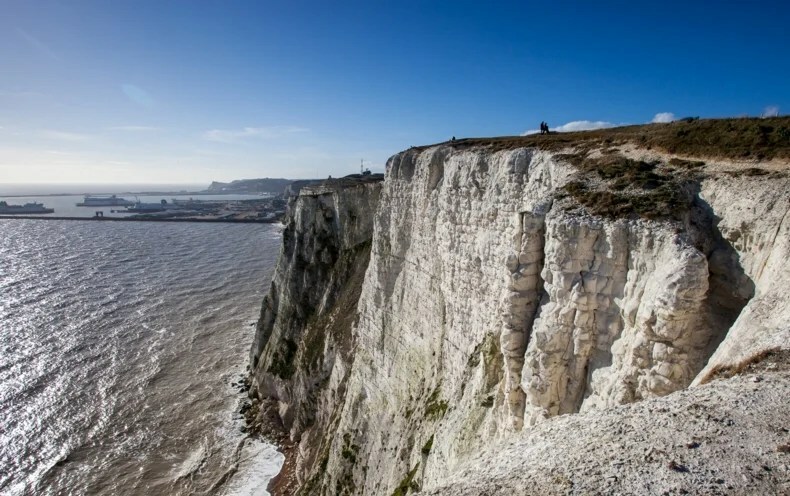 These limestone cliffs along the English coastline are composed of calcium carbonate that formed when the skeletal remains of planktonic algae sank to the bottom of the ocean during the Cretaceous period. It appears that levels of both carbon dioxide and nitrogen (which is similarly whipped between Earth’s mantle and atmosphere) can be subject to a planet’s biosphere. Life creates conditions that help sustain itself. M-dwarf stars are excellent targets for planet searches because the signal of an orbiting planet is relatively larger (and therefore easier to detect!) around small, dim M dwarfs, compared to Sun-like stars. But are there better or worse stars to target within this category when searching for habitable, Earth-like planets? Radial velocity campaigns search for planets by looking for signatures in a star’s spectra that indicate the star is “wobbling” due to the gravitational pull of an orbiting planet. Unfortunately, stellar activity can mimic the signal of an orbiting planet in a star’s spectrum — something that is particularly problematic for M dwarfs, which can remain magnetically active for billions of years. To successfully detect planets that orbit in their stars’ habitable zones, we have to account for this problem. False planet detections caused by stellar activity often appear as a “planet” with an orbital period that’s a multiple of the stellar rotation period. If a star’s rotation period coincides with the range of orbital periods corresponding to its habitable zone, it’s therefore possible to obtain false detections of habitable planets. All stars become less magnetically active and rotate more slowly as they age, but the rate of this decay depends on their mass: lower-mass stars stay magnetically active for longer and take longer to spin down. It’s ideal to be able to follow up on potentially habitable exoplanets, and search for biosignatures such as oxygen in the planetary atmosphere. This type of detection will only be feasible for low-mass dwarfs, however, due to the relative size of the star and the planet. 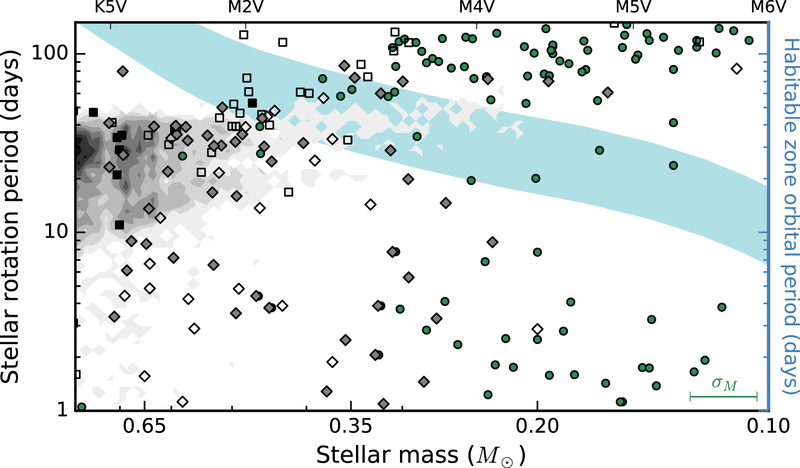 Newton and collaborators find that stars in the mass range of 0.25 to 0.5 solar mass (stellar class M1V-M4V) are non-ideal targets, because their stellar rotation periods (or a multiple thereof) coincide with the orbital periods of their habitable zones. In addition, atmospheric characterization will only be feasible in the near future for stars with mass less than ~0.25 solar mass. On the other hand, dwarfs with mass less than ~0.1 solar masses (stellar classes later than M6V) will retain their stellar activity and faster rotation rates throughout most of their lifetimes, making them non-ideal targets as well. When searching for habitable exoplanets, the best targets are therefore the mid M dwarfs in the mass range of 0.1 to 0.25 solar mass (stellar class M4V-M6V). Building a sample focused on these stars will reduce the likelihood that planets found in the stars’ habitable zones are false detections. This will hopefully produce a catalog of potentially habitable exoplanets that we can eventually follow up with atmospheric observations. One of the main goals of exoplanet surveys like the Kepler mission is to find potentially habitable planets orbiting other stars. Finding planets in a star’s habitable zone, however, is easier when we know in advance where to look! A recent study has provided us with a starting point. A habitable zone is defined as the range of distances from a star where liquid water could exist on an orbiting planet, given a dense enough planetary atmosphere. The habitable zone can be calculated from the star’s parameters, and the inner and outer edges of a habitable zone are set considering hypothetical planetary atmospheres of different composition. Knowing the parameters of the habitable zones around nearby stars is important for current and future exoplanet surveys, as this information allows them to identify stars with habitable zones that can be probed, given the survey’s sensitivity. To provide this target selection tool, a team of scientists led by Colin Chandler (San Francisco State University) has created a catalog of the habitable zones of roughly 37,000 nearby, main-sequence stars. The Catalog of Earth-Like Exoplanet Survey Targets, or CELESTA, was built starting with the Revised Hipparcos Catalog, a high-precision catalog of photometry and parallax measurements (which provides the star’s distance) for 117,955 bright, nearby stars. Chandler and collaborators combined these measurements with stellar models to determine parameters such as effective temperature, radius, and mass of the stars. The authors exclude giant stars and cool dwarfs, choosing to focus on main-sequence stars within the temperature range 2600–7200K, more similar to the Sun. They test their derived stellar parameters by comparing to observational data from the Exoplanet Data Explorer (EDE), where available, and confirm that their photometrically derived stellar parameters agree well with the parameters in EDE, typically measured spectroscopically. The final CELESTA catalog details the habitable zones of 37,354 bright, main-sequence stars. The stars’ habitable-zone widths are generally under 5 AU, with the majority falling between 1 and 1.5 AU. The authors also provide an estimate of how many of these habitable zones current surveys (like Kepler) and upcoming surveys (like the Transiting Exoplanet Survey Satellite, or TESS) will be able to probe, based on the duration of the surveys’ typical campaigns. Though a planet’s potential for habitability relies on additional factors besides the location of its orbit, cataloging the locations of stellar habitable zones for nearby, observable stars is an important start. CELESTA is an excellent reference for this, and it will provide a living resource that the authors plan to continue to update with additional stars, as well as with improved-accuracy stellar measurements, expected from upcoming astrometric missions. By analysing these planetary systems, researchers from the Australian National University and the Niels Bohr Institute in Copenhagen have calculated the probability for the number of stars in the Milky Way that might have planets in the habitable zone. The calculations show that billions of the stars in the Milky Way will have one to three planets in the habitable zone, where there is the potential for liquid water and where life could exist. The results are published in the scientific journal, Monthly Notices of the Royal Astronomical Society. Planets outside our solar system are called exoplanets. 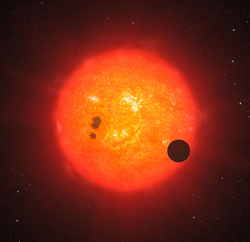 The Kepler satellite observes exoplanets by measuring the light curve of a star. When a planet moves in front of the star there is a small dip in brightness. If this little dip in brightness occurs regularly, there might be a planet orbiting the star and obscuring its light. Using NASA’s Kepler satellite, astronomers have found about 1,000 planets around stars in the Milky Way and they have also found about 3,000 other potential planets. Many of the stars have planetary systems with 2-6 planets, but the stars could very well have more planets than those observable with the Kepler satellite, which is best suited for finding large planets that orbit relatively close to their stars. 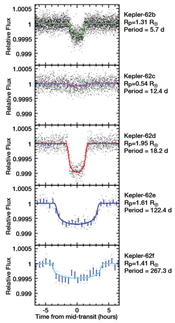 Light curves of the five planets orbiting the star Kepler-62. The dip in the light curve occur when the planet moves in front of the host star, thereby dimming the light of the star. The dip in the light curve is proportional to the size of the planet. The two light curves at the bottom of the plot are of planets in the habitable zone. The Titius-Bode law was formulated around 1770 and correctly calculated the position of Uranus before it was even discovered. The law states that there is a certain ratio between the orbital periods of planets in a solar system. So the ratio between the orbital period of the first and second planet is the same as the ratio between the second and the third planet and so on. Therefore, if you knew how long it takes for some of the planets to orbit around the Sun/star, you can calculate how long it takes for the other planets to orbit and can thus calculate their position in the planetary system. You can also calculate if a planet is ‘missing’ in the sequence. “We decided to use this method to calculate the potential planetary positions in 151 planetary systems, where the Kepler satellite had found between 3 and 6 planets. In 124 of the planetary systems, the Titius-Bode law fit with the position of the planets as good as or better than our own solar system. Using T-B’s law we tried to predict where there could be more planets further out in the planetary systems. But we only made calculations for planets where there is a good chance that you can see them with the Kepler satellite,” explains Steffen Kjær Jacobsen, PhD student in the research group Astrophysics and Planetary Science at the Niels Bohr Institute at the University of Copenhagen. In 27 of the 151 planetary systems, the planets that had been observed did not fit the T-B law at first glance. They then tried to place planets into the ‘pattern’ for where planets should be located. Then they added the planets that seemed to be missing between the already known planets and also added one extra planet in the system beyond the outermost known planet. In this way, they predicted a total of 228 planets in the 151 planetary systems. 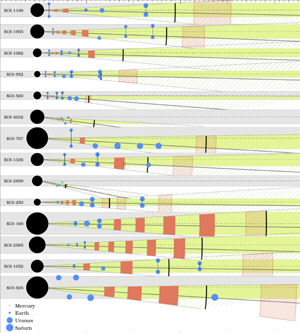 “We then made a priority list with 77 planets in 40 planetary systems to focus on because they have a high probability of making a transit, so you can see them with Kepler. We have encouraged other researchers to look for these. 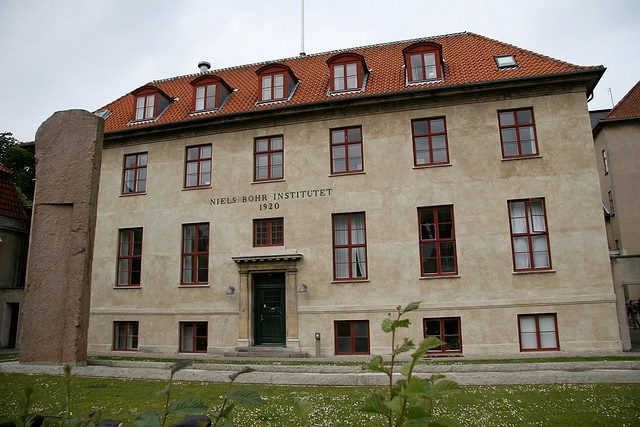 If they are found, it is an indication that the theory stands up,” explains Steffen Kjær Jacobsen. Exoplanetary systems where the previously known planets are marked with blue dots, while the red dots show the planets predicted by the Titius-Bode law on the composition of planetary systems. 124 planetary systems in the survey – based on data from the Kepler satellite, fit with this formula. “In these 31 planetary systems that were close to the habitable zone, our calculations showed that there was an average of two planets in the habitable zone. According to the statistics and the indications we have, a good share of the planets in the habitable zone will be solid planets where there might be liquid water and where life could exist,” explains Steffen Kjær Jacobsen. Among the billions and billions of stars in the sky, where should astronomers look for infant Earths where life might develop? New research from Cornell University’s Institute for Pale Blue Dots shows where – and when – infant Earths are most likely to be found. The paper by research associate Ramses M. Ramirez and director Lisa Kaltenegger, The Habitable Zones of Pre-Main-Sequence Stars will be published in the Jan. 1, 2015, issue of Astrophysical Journal Letters. “The search for new, habitable worlds is one of the most exciting things human beings are doing today and finding infant Earths will add another fascinating piece to the puzzle of how ‘Pale Blue Dots’ work” says Kaltenegger, associate professor of astronomy in Cornell’s College of Arts and Sciences. The researchers found that on young worlds the Habitable Zone – the orbital region where water can be liquid on the surface of a planet and where signals of life in the atmosphere can be detected with telescopes – turns out to be located further away from the young stars these worlds orbit than previously thought. Moreover, say the researchers, since the pre-main sequence period for the coolest stars is long, up to 2.5 billion years, it’s possible that life could begin on a planet during its sun’s early phase and then that life could move to the planet’s subsurface (or underwater) as the star’s luminosity decreases. “In the search for planets like ours out there, we are certainly in for surprises. That’s what makes this search so exciting,” says Kaltenegger. To enable researchers to more easily find infant earths, the paper by Kaltenegger and Ramirez offers estimates for where one can find habitable infant Earths. As reference points, they also assess the maximum water loss for rocky planets that are at equivalent distances to Venus, Earth and Mars from our Sun. Ramirez and Kaltenegger also found that during the early period of a solar system’s development, planets that end up being in the Habitable Zone later on, when the star is older, initially can lose the equivalent of several hundred oceans of water or more if they orbit the coolest stars. However, even if a runaway greenhouse effect is triggered – when a planet absorbs more energy from the star than it can radiate back to space, resulting in a rapid evaporation of surface water – a planet could still become habitable if water is later delivered to the planet, after the runaway phase ends. Ramirez and Kaltenegger’s research was supported by the Institute for Pale Blue Dots and the Simons Foundation. There are currently almost 2,000 extrasolar planets known to us, but most are inhospitable gas giants. Thanks to NASA’s Kepler mission, a handful of smaller, rockier planets have been discovered within the habitable zones of their stars that could provide a niche for alien life. The habitable zone of a star is typically defined as the range from a star where temperatures would allow liquid water to exist on the surface of a planet. At the inner edge of this zone, the star’s blistering heat vaporizes the planet’s water into the atmosphere in a runaway greenhouse effect. At the outer edge of the habitable zone, temperatures are so cold that clouds of carbon dioxide form and the little solar energy that does arrive bounces off the clouds, turning the planet into a frozen wasteland. However, this concept is rather simple. In reality, many other factors come into play that could affect a planet’s habitability. New research has revealed that the rate at which a planet spins is instrumental in its ability to support life. Not only does rotation control the length of day and night, it can also tug on the winds that blow through the atmosphere and ultimately influence cloud formation.The paper has been accepted to Astrophysical Journal Letters and a preprint is available online at Arxiv. The radiation that the Earth receives from the Sun is strongest at the equator. The air in this region is heated until it rises up through the atmosphere and heads towards the poles of the planet where it subsequently cools. This cool air falls through the atmosphere and is ushered back towards the equator. This process of atmospheric circulation is known as a Hadley cell. If a planet is rotating rapidly, the Hadley cells are confined to low latitudes and they are arranged into different bands that encircle the planet. Clouds become prominent at tropical regions, which are important for reflecting a proportion of the light back into space. However, for a planet in a tighter orbit around its star, the radiation received from the star is much more extreme. 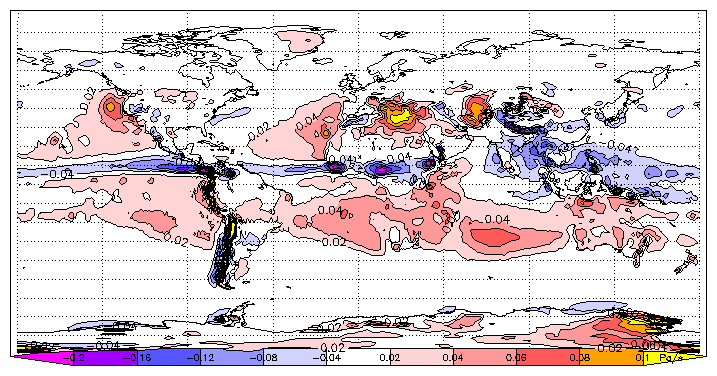 This will decrease the temperature difference between the equator and the poles and ultimately weaken the Hadley cells. The result is fewer clouds at the tropical regions available to protect the planet from the intense heat, and the planet becomes uninhabitable. If, on the other hand, the planet is a slow rotator, then the Hadley cells can expand to encompass the entire world. This is because the atmospheric circulation is enhanced due to the difference in temperature between the day and night side of the planet. The days and nights are very long, so that the half of the planet that is bathed in light from the star has plenty of time to soak up the Sun. In contrast, the night side of the planet is much cooler, as it has been shaded from the star for some time. This difference in temperature is large enough to cause the warm air from the day side to flow to the night side, in a similar manner as opening a door on a cold day results in warm air fleeing from a room. The increased circulation causes more clouds to build up over the substellar point, which is the point on the planet where the star would be seen directly overhead, and where radiation is most intense. The clouds over the substellar point then create a shield for the ground below as most of the harmful radiation is reflected away. The high albedo clouds can allow a planet to remain habitable even at levels of radiation that were previously thought to be too high, so that the inner edge of the habitable zone is pushed much closer to the star. “Rotation can have a huge effect, and lots of planets that we previously thought were definitely not habitable now can be considered as candidates,” says Dorian Abbot of the University of Chicago, and a co-author on the paper. The study used computer simulations to show that a slowly rotating planet with the same atmospheric composition, mass, and radius of the Earth could potentially be habitable even at Venus’ distance from the Sun. Under the typical boundaries of a habitable zone, Venus is situated closer to the Sun than the inner edge of the zone. In the study, the simulated planet received almost twice as much radiation as the actual Earth did, and yet the surface temperature was cool enough for life to thrive due to the shielding clouds. Despite the slow rotation, Venus itself is actually a scorching hot planet with a atmosphere so dense that it would crush a person on the surface in seconds. This goes to show that just because a planet is rotating slowly does not automatically mean that it is habitable, rather it has the potential to be habitable if the right conditions exist. For instance, it is possible that Venus used to spin much faster, giving shorter days than it has now. Venus’ atmosphere is enriched with deuterium, which indicates that an ocean might have once been present. Such a rapid rotation rate on a planet so close to the Sun would have led to a runaway greenhouse effect and the loss of the oceans. By the time the rotation of the planet slowed to its current rate the damage was irreversible. While it is difficult to measure planetary rotation rates, future observations by the James Webb Space Telescope might be able to measure rotation if the right conditions were present. The James Webb Space Telescope is an infrared telescope due to launch in 2018, and it is capable of measuring the level of heat emitted by exoplanets. The telescope would be able to measure the heat emitted from any high albedo clouds that are formed over the substellar point. An unusually low temperature at what is expected to be the hottest location on the planet could indicate that the planet is a potentially habitable slow rotator. “From space, Earth looks like it is between -70 and -50 degrees Celsius over large regions of the western tropical Pacific because of high clouds there, even though the surface is more like 30 degrees Celsius,” says Abbot. It is also known than many planets that orbit cool M dwarf stars are either tidally locked, meaning that the same side of the planet faces the star all the time, or they are slow rotators. This research emphasises the importance of looking beyond the traditional habitable zone for planets that could host life, and it turns out that planets we once thought were too hot might actually be just right for life.